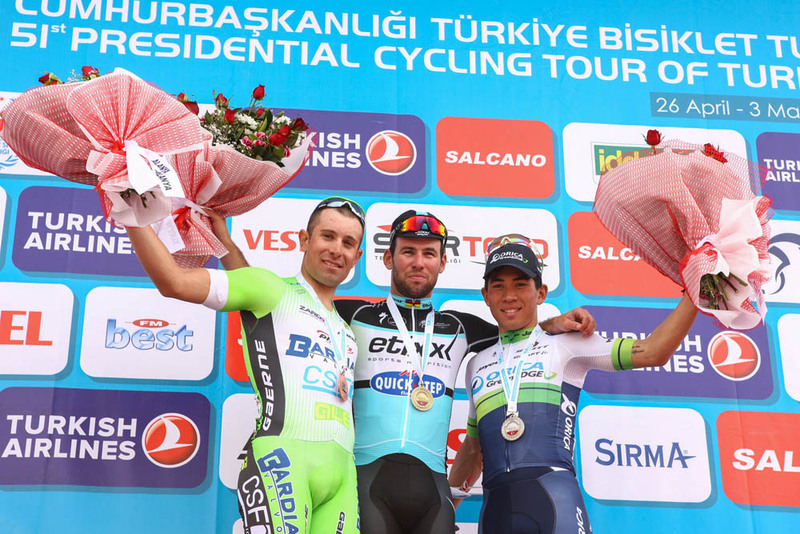 Mark Cavendish (Etixx-QuickStep) claimed the opening stage of the 2015 Presidential Cycling Tour of Turkey on Sunday. Cavendish won the bunch sprint after a perfect lead-out from the Etixx squad at the end of the 145-kilometre stage looping around Alanya. Australian prodigy Caleb Ewan (Orica-GreenEdge) placed second, with Italian Nicola Ruffoni (Bardiani-CSF) in third. Cavendish’s win means that he wears the leader’s jersey going into Monday’s second stage Alanya to Antalya covering 182 kilometres. It’s the Manxman’s seventh victory of the season – only Alexander Kristoff (Katusha) and Richie Porte (Sky) have won more, with 11 and nine wins respectively. “This is… my first race back after taking some time off,” said Cavendish after the win. “I got sick in South Africa and had to stop and get over the virus. Just to stop and reset everything and to now get going again, it is quite nice. The eight-stage, UCI 2.HC-ranked Tour of Turkey concludes on May 3. Last year’s race was won by British rider Adam Yates (Orica-GreenEdge), but he is not present to defend his title this year. Cavendish won four stages and the points classification. After the Tour of Turkey, Cavendish will take part in the Tour of California and Tour de Suisse before the Tour de France in July.